Any interest in developing an open source fuel economy gauge/computer? Since a very basic atmel chip would be enough for this I would say the controller would be less than 3 bucks. A 2x16lcd is under $20. So I would say the whole setup with the vss and injector circuits should be less than $50. A basic interface to calibrate the speed and fuel might need 2 buttons. With a 2x16 display you could have 4 numbers displayed. So I would say instant MPG, last minute avg MPG, Trip MPG 1 and Trip MPG 2. The buttons could be used to reset the trip numbers in normal use. Maybe use a jumper on the board to put it into programming mode. Be a very simple addition but could make it a lot easier for normal use. There would be no point in putting a tank mpg on there since one of the trip meters could be used for that or not depending on what the person using it wants to do. Also: I could calibrate mine quickly against the SG and then pass the settings on to anyone else with a mk4/5 car. What would be the difference between avg MPG and Trip 1/2? Another good parameter the MID has: % engine on vs. engine off by distance. What else does it have, Ben? The ability to view FE in different measurements would be good too. It's one of the things that held back the SMID's popularity on this side of the pond. L/100 km, km/L, mpg (US), mpg (Imp). I've done PLC's/PIC's, LCD's, and I do a lot of general coding for Linux projects; I think I can contribute a lot, but it may have to wait 6 weeks. Anyways, what I need help understanding is how to access the data - that is get the measurements on the wide range of vehicles we want it for. I do not know cars yet! Can we gather the information directly from gauges already installed? Which are best to read from? Will they all be sending the same conditioned signal - that is, the same voltage range scaled the same amount? If not then we need some rudimentary way of calibrating it, which would be easy for mileage but harder for fuel. I would be quite interested in a Pre-OBD2 setup. If you could make it interface with a Linux PC so much the better. Yoshi had the right idea and I think the easiest route would be to learn from his lead. Common microchip, homemade PC board, cheap 20 line display, etc. 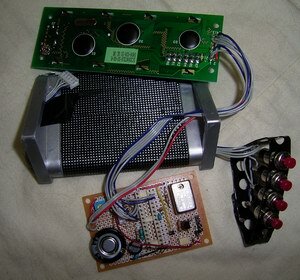 Look at the simplicity of the design compared to the arduino. No pre-etched board and just a bunch of components that can be bought at once from Digikey, Mouser, etc. Anyways, what I need help understanding is how to access the data - that is get the measurements on the wide range of vehicles we want it for. I do not know cars yet! I'm pretty sure Yoshi pulled the signal from one of the injector wires coming out of the ECU and tapped into the electronic VSS signal at the speedo. Last edited by LostCause; 03-17-2008 at 01:25 AM.. I'm pretty sure PIC's need an external box for programming and PC boards need some specialized equipment to etch. The code could be put available online for everyone, programmed PIC's could be sold for a tiny profit by someone with the equipment for those without, and etched PC boards could do the same. Essentially, there would be a few specialized parts that someone with enough desire could still acquire cheaply on their own if community supply lines shut down. Everything else could be condensed as a shopping list from Digikey, Mouser, etc. Depending on the PIC and school, there is a good chance one of us at a university has access to the development kits for the controller so we can develop and test before committing to buying them. Generally development kits are not so cheap in my experiences. I'd go with a PIC processor over a prefabbed circuit. What happens five years from now when the arduino is no longer available? That's just me, as someone with limited experience with microcontrollers - which is very likely the case for someone that is going to replicate any efforts. I think for the input signals the easiest thing would be run a 10k resistor to a 5v zener. Then maybe use a transistor to isolate the microcontroller if needed. That should get a signal the controller is able to handle. The VSS is just a voltage pulse every so often. Usually so many pulses per mile. So to measure it, just set an interrupt and use a bit of math to calculate speed by averaging the last few pulses for a steady number. The injector would need a pair of interrupts. One rising edge and one falling edge. That can give a good way to measure pulse width of the injectors. Once the basic math is figured out converting to whatever unit is needed would be a simple matter I figure. The avg mpg I was thinking of was 'Last minute avg MPG' That seems useful to make sure you aren't getting high peaks in the instant mpg reading but killing your avg by doing it wrong. Really once the vss and injectors are going into the controller anything you can do with those numbers would be pretty easy to implement. Writing it in a higher level language like C and not assembly makes stuff like that just a few minutes worth of work. There are some really simple atmel programming setups. So a programming circuit could be as simple as a single IC and a few wires. I figure there will be a lot of people not willing to build their own and will want to buy one. Having a easy to build system would be nice for whoever wants to make and sell them assembled. Another advantage of the atmega setup is that even if the chip is discontinued it would be a 5 minute job to port the code to a new one assuming there isn't one that is directly compatible. Aww, you guys quoted before I had a change of heart and edited my post. I'm just concerned over availability and cost. By building the circuit with basic components that are widespread and cheap, then what is developed here will always be available. I just like the idea of ordering everything at once from Digikey or Mouser rather than having to go through specialized sources (arduino, someone on this forum, etc.). There are less logistics to deal with that way. Ahh, this is the method I am trying to describe! Simple, available to all, and easily adaptable if a component is no longer supported. If it isn't too much trouble, it would be cool to see the development (i.e. steps taken in detail) laid out so we can follow the logic. The superMID also has lap capability, which is good for lots of testing and not writing things down, but if it was possible I'd much rather have usb data logging than lap recording.